闫志闯, 李婧, 楼楠. 伪随机脉冲对卫星轨道拟合精度影响分析[J]. 大地测量与地球动力学, 2019, 39(4): 387-391. YAN Zhichuang, LI Jing, LOU Nan. 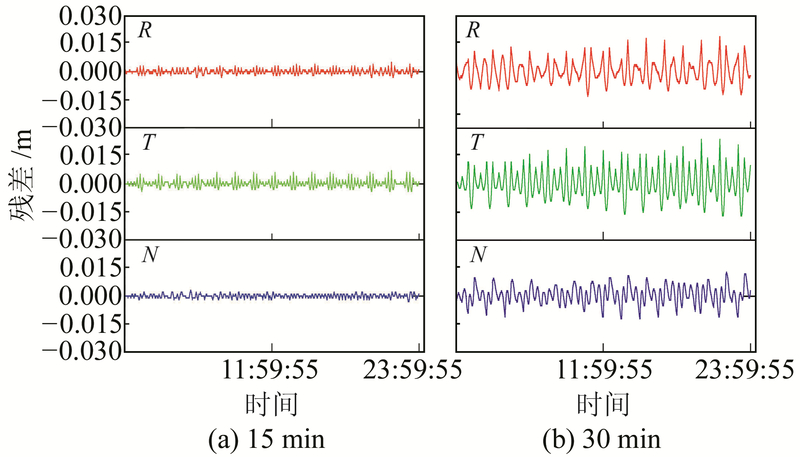 Influence of Pseudo-Stochastic Pulse on Satellite Orbit Fitting[J]. Journal of Geodesy and Geodynamics, 2019, 39(4): 387-391. YAN Zhichuang, PhD, engineer, majors in precise orbit determination, algorithm research and software developing about GNSS & LEOs, E-mail:yanpipi2010@163.com. About the first author: YAN Zhichuang, PhD, engineer, majors in precise orbit determination, algorithm research and software developing about GNSS & LEOs, E-mail:yanpipi2010@163.com. Abstract: We study the influence of pseudo-stochastic pulse in the absorption of low earth orbit (LEO) satellites and the unmodeled perturbation forces of four navigation systems. We also analyze the influence of accuracy on fitting orbit. The results show that pseudo-stochastic pulse can effectively absorb the unmodeled perturbation forces of LEO and GNSS satellites. For LEO satellites, pseudo-stochastic pulse can simulate the influence of atmospheric resistance on orbit, and achieve millimeter level fitting precision. For GNSS satellites, pseudo-stochastic pulse can only absorb sun light pressure perturbation to some extent; however, combined with the ECOM sun light model it can fully absorb perturbation forces unabsorbed by the ECOM model and achieve millimeter level fitting precision, requiring setting up a set of pseudo-stochastic pulse parameters every day.